­­­­­­­­­­­­­­­­­­­­­­­­­­­­­­­­­­­­­­­­­­­­­­­­­­­­­­­­­­­­­­­­­­­Why trees have to die? Olga on Oily Scalp & Dry Hair – Treatment | 490ml / 16.5 fl. oz. 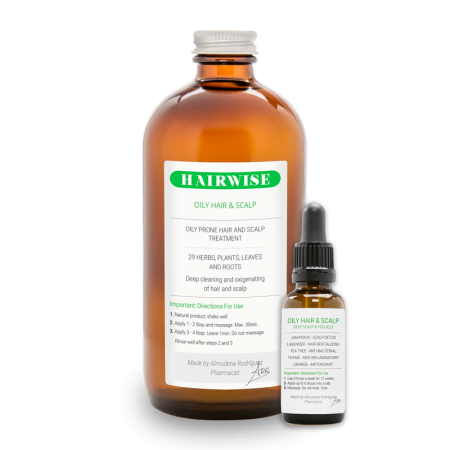 Oily Hair & Scalp – Treatment | 490ml / 16.5 fl. oz. 30ml / 1 fl. oz. In normal conditions, sebaceous glands secrete oil (sebum) to protect and lubricate hair and scalp. However, when the inflammation is present, there is an excess of sebum production, oil suffocates and does not let oxygen go through the hair follicle, making the hair weak and thin till it falls out. It increase the microcirculation, giving strength to the hair. Juniper essential oil has several mechanisms which enabled radical scavenging properties, providing protection against cells oxidative damage. Juniper has an anti-inflammatory and anti-bacterial properties. Juniper is obtained by steam distillation the juniper berry fruit and its needles. Anti-oxidant, anti-bacterial activity, free radical-scavenging. Lavender is well known in traditional natural medicine and in the healthcare field (dermatology and minor therapy symptoms). It’s remarkably effective against free radical-scavenging activity and lipid peroxidation. Lavender essential oil is extracted by steam distillation. Both its flowers and its leaves are used. Melaleuca is widely distributed in northern and western parts of Australia. Melaleuca viridiflora essential oil is obtained from the leaves and twig. Its pale yellow can become dark yellow depending on the copper content of the soil, and which can be traced in the oil. Anti-inflammatory. It helps bring balance to the sebaceous gland production. Thymol and P-Cymene are the main active ingredients of Thyme. Thyme’s natural essential oil is extracted by steam distillation of the whole plant. Its main compounds are D-Limonere and Oxygenated Monoterpenes. They help promote the blood flow in the scalp. Orange Essential Oil is a well known anti-inflammatory agent. It also contains bioactive components such as phenolics, flavonoids and vitamins which have anti-oxidant properties. Orange essential oil increases the effects of other botanical ingredients when combined. It’s extracted from the orange peel. Refreshes and clarifies hair and scalp. 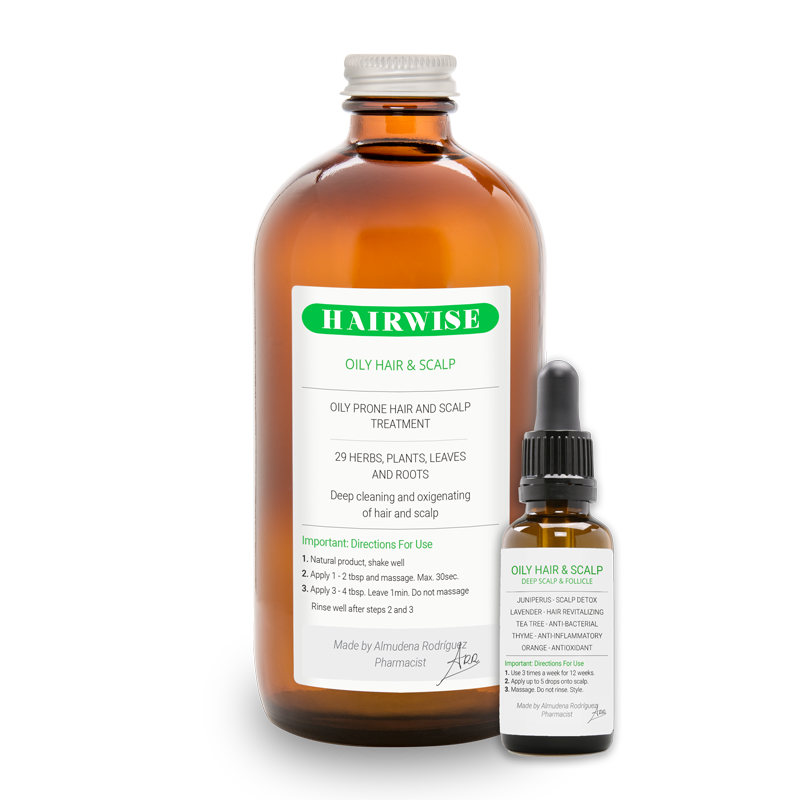 Decreases the excess of sebum bringing balance back to hair and scalp without drying your hair. Removes impurities and reduces itchiness through its anti-bacterial and anti-inflammatory properties. • Yeast is a significant source of vitamin B complex. • Contains folic acid and minerals such as iron, chrome and zinc (a trace element of vital importance for the hair growth). Purified Water(Aqua), Lavandula Officinalis(flower), Citrus Medica Limonum(lemon peel), Melaleuca Artenifolia(leaves), Aspalathus Linearis (Rooibos leaves), Viscum Album (fruit), Decyl Glucoside(plant derived), Coco Betaine(coconut derived), Polyquaternium 7, Behentrimonium chloride (Canola oil derived), Juniperus Communis(fruit), Pinus Montana(needle), Abies Alba(needle), Melaleuca Leucadendra(leaves), Melaleuca Viridiflora(leaves), Pimenta Acris(fruit), Salvia Officinalis(leaves), Coríandrum Sativum(fruit), Lavandula Latifolia(flower), Acorus Calamus(root), Carum Carvi(fruit), Anethum Graveolens(fruit), Lavandula Angustifolia(flower), Citrus Dulcis(orange peel), Citrus aurantium(bitter orange peel), Myristica Fragrans(seed), Pinus Pinaster(leaves), Eucalyptus Globulus(leaves), Mentha Viridis(leaves), Thuja Occidentalis(leaves), Rosmarinus Officinalis(leaves), Origanum Majorana,(leaves), Chamomilla Recutita(flower), Juníperus Virginiana(leaves), Tocopherol(vitamin E), Phenoxyethanol (preservative), Lemongrass (preservative from Cymbopogon Schoenanthus Extract), Honeysuckle (preservative from Lonicera Caprifolum). © COPYRIGHT 2018 – WE THE HAIR LAB, LLC.